No other dish of this design appears to be published. Gilt decoration was used very sparingly in the 18th century and largely enhanced designs in famille verte, famille rose and simulated enamel porcelain vessels. Cf. a large yenyen vase in the Beijing Palace Museum, illustrated in Sekai Toji Zenshu, vol. 15, Japan, 1976, no. 3, where whole lotus blossoms are gilt decorated. Two other Qianlong-marked examples are illustrated ibid., no. 115 from the Baur Collection, and no. 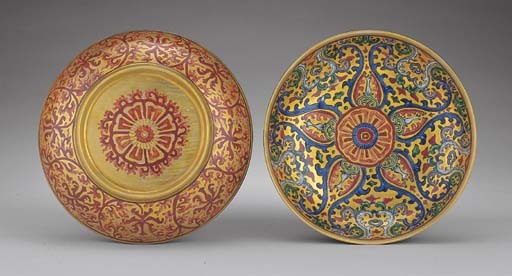 116 from the Palace Museum, both decorated in famille rose imitating painted enamel wares where the enhancement produces the effect of gilt bronze.